Robert Mueller. Photo: Alex Wong/ Getty Images. A court has decided to release documents related to independent counsel Ken Starr’s investigation into former President Bill Clinton that eventually led to Clinton’s impeachment. That investigation was similar to the special counsel Robert Mueller’s Russia investigation in several ways. It may provide clues for Mueller on how to get President Donald Trump to testify under oath. Trump’s lawyers though have been stonewalling Mueller – and negotiations between the two legal teams might take up to six months. Trump praised Starr in a tweet on Sunday. A federal court in Washington, DC, will unseal a trove of documents related to independent counsel Ken Starr’s investigation into former President Bill Clinton that eventually led to his 1999 impeachment, CNN reported. The documents, which remained sealed for almost 20 years, will likely shed light on how Starr was able to get Clinton to testify in his investigation after six months of negotiating with his legal team. Robert Mueller, the special counsel investigating Russian interference in the 2016 election and whether President Donald Trump obstructed justice in the probe, has found himself increasingly stonewalled by White House lawyers in his bid to get testimony from Trump. Starr and Mueller’s investigations are similar in that they both issued grand jury subpoenas to witnesses and were led by an independent investigator. Although Mueller had hoped to sit down with Trump within the first few months of 2018, if Starr’s precedent is any indication, Mueller will need to endure months of back-and-forth negotiations, potentially resulting in a showdown at the Supreme Court. The documents the DC court is set to unseal are related to eight different cases in which individuals were handed subpoenas requiring them to testify. Individuals mentioned in the cases will have a chance to voice any concerns about the documents’ release, according to CNN. 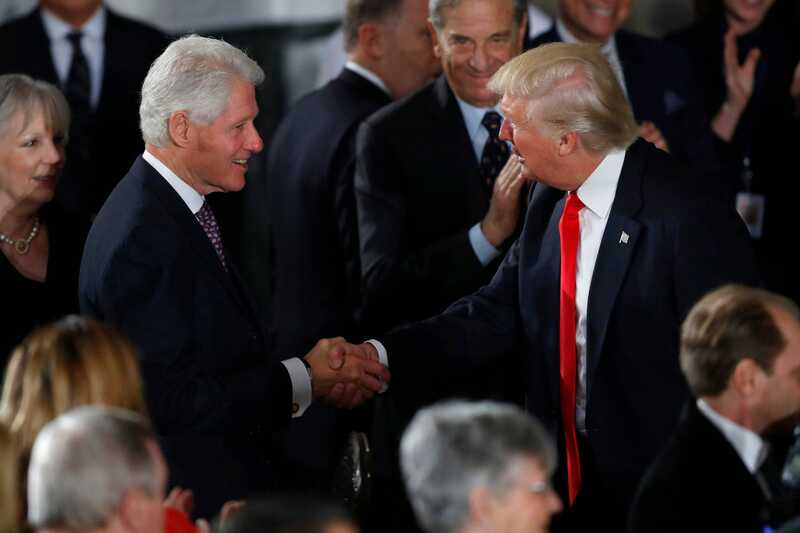 Aaron P. Bernstein/Getty ImagesPresident Donald Trump greets former President Bill Clinton at the Inaugural Luncheon in the US Capitol on January 20, 2017. Trump’s legal team is reportedly also hoping to use a Clinton-related investigation from the 1990s as a model for how to avoid an interview with Mueller. Business Insider has reported that Trump’s team is using a 1994 investigation by an independent counsel into a Clinton administration official as a roadmap to limit the scope of questioning in the event that the president will eventually be forced to testify. But Lanny Davis, a former special counsel, said Trump might be running out of options. “No matter how much huffing and puffing Trump’s lawyers do, they cannot escape a grand-jury-issued subpoena,” Davis said. Trump’s current strategy is much different from the one he initially articulated in January before reporters. Trump’s lawyers quickly walked back that statement, saying they would ultimately decide whether he would talk with Mueller. Trump tweeted his apparent approval of the former special prosecutor on Sunday after Starr gave an interview on Fox News. Starr spoke about Mueller’s indictments on Friday of Russian nationals responsible for interfering in the 2016 presidential election. “Thank you to KenStarr, former Independent Counsel, Whitewater, for your insight and powerful words on FISA abuse, Russian meddling etc. Really great interview with @MariaBartiromo,” Trump tweeted. During the interview, Starr said the real enemy was apparently Russia, not Trump. Yet Trump may yet be undone by Starr’s legal precedent. It remains to be seen how, if at all, Mueller uses documents the courts are likely to unseal for his disposal.